Did you hear about this story? It reminded me that there is HUGE value in nudging the entrepreneurial spirit in our daughters. A young teen in North Minneapolis had the police called on him. He was running a hot dog stand to pay for school supplies. Someone called the permit police because he did not have a license. This story ends well. But it also provides a few tips for any teen who wants to start a business. There are a handful of things you want to do if you are unsure about how to get started. 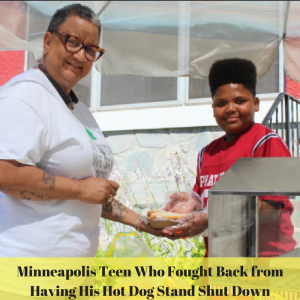 The residents of North Minneapolis were shocked by what the city did for a teen who opened a hot dog stand to sell hot dogs. After a complaint, the city decided to help the thirteen-year-old Jaequan Faulkner to open up a place outside his home. He was raising money for school supplies. According to Dan Huff, the Minneapolis Environmental Health Director, “When I realized what it was, I said, ‘No, we’re not going to just go and shut him down’ like we would an unlicensed vendor,”. He organized some support and helped Jaequan get licensed. There are city officials who get it and want to support youth. City officials are willing to help. They spent time training Jaequan and contacted Northside Economic Opportunity Network (NEON). Together they helped him set up a legitimate business. Consider calling your local council person’s office or politician. They might have recommendations about programs in your area. If you are starting a food based business, you will probably need a permit or license. So ask what types of businesses will need permits or licenses for your area. For example, in New York City, there is the Department of Small Business Services. While their programs are focused on adults, they do have walk-in hours as well as random workshops for young people. So reach out and see what resources exist. Google entrepreneurship training in your area to see if there are nonprofits who offer training programs. I remember the first youth entrepreneurship program I had the privilege to teach. We reached out to area nonprofits to find young people interested. We had little time to invest in marketing or widespread outreach. But happily, the nonprofits we partnered with were influential and made recommendations. Therefore, there might be a program already in existence in your area. Make Google your BFF. Or consider dropping the idea into the discussion. Your school or local after school programs might be looking for new program ideas. There are a host of organizations that have curriculum and can provide programming support. 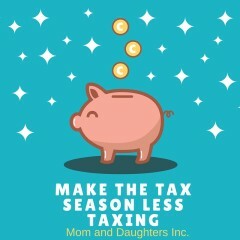 Your child doesn’t need to wait until she is old enough to learn how to start a business. During the weekends, evening after school or the holidays, she can start a business if she wants to. In the case of Jaequan Faulkner, he was only thirteen and the Minneapolis Environmental Health helped him get the permit. They made the whole idea a positive thing and helped him own a business. Learning entrepreneurship skills at an early age is very crucial, especially for young girls. 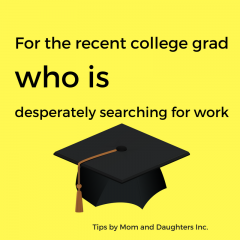 When you think about teaching your daughter entrepreneurship skills, a lot can be said and done. So consider some of the ideas in this article. You’ll take care of the legal requirements – ie. do you need a permit or license? And what resources already exist? And make sure to encourage young people to roll up their sleeves and market their talents. I love Jaequan’s spirit and hope other young people will be willing to do the same! You'll gain more tips on how to think like an entrepreneur and succeed in college!! Because the tips are written to guide your next steps. It’s Women’s History Month. 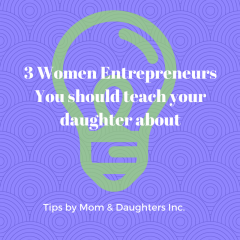 What better time to teach your daughters about inspiring women entrepreneurs!! Why is this important? Being able to turn your ideas into a viable business is a great path for empowerment. You have to handle your customer needs with the day to day challenges of running a business. But, when you succeed and earn a serious profit, you prove to other women what is possible. #win-win. Here is a short list of a few women of color entrepreneurs at top of their respective fields. I hope it inspires your daughter to think big and take action. 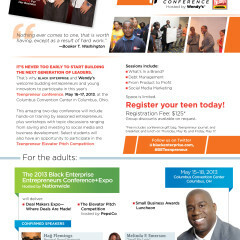 Send your dghtr to Teenpreneurs this year! Scholarships available.